You know what causes a social media crisis – most often, it’s when companies have not thought things through. But do we know what actually happens in a case of a social media crisis, day by day? We wondered how long do social media crises usually last, and how they come to be. 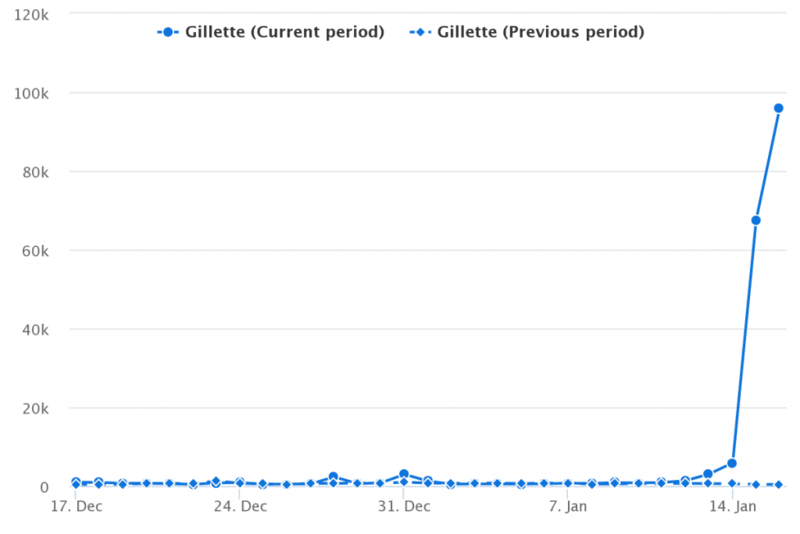 Recently we analyzed the case of Dove’s ad media to see not why, but HOW a crisis spreads on social media, how long it lasts, and whether can it teach us something. 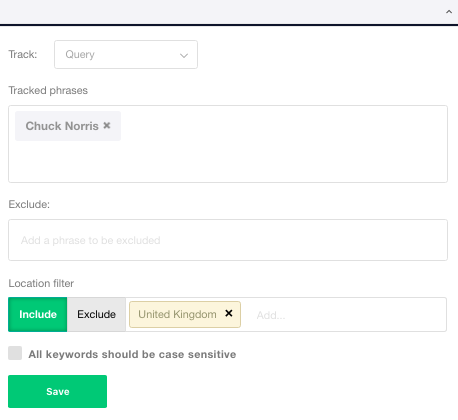 We initially performed the analysis for Huffington Post contributor Mary Simms. You can check out her take on social media crises here. In a short amount of time, the post got shared by more than 10 thousand people. Soon Twitter users started sharing the post, the media were quick to pick up on the story, and it all snowballed from there. 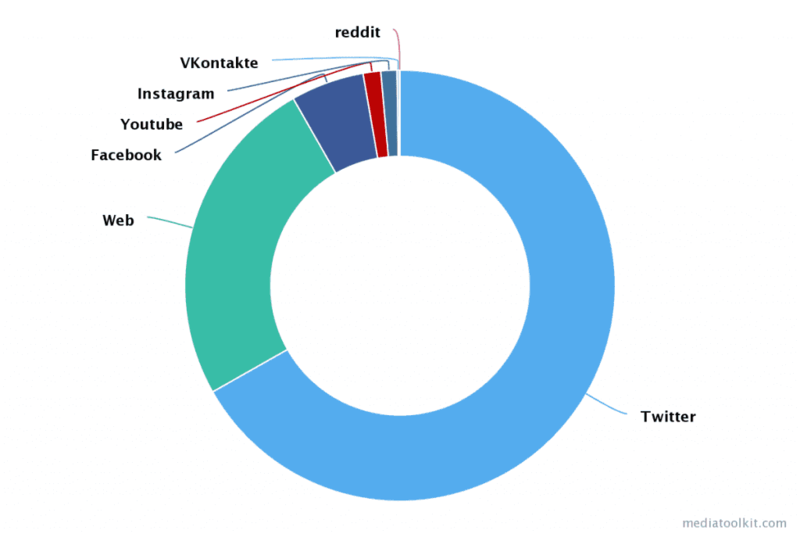 More than 30.000 posts (shares not included) discussed the ad between October 6 – October 13. 44.55 percent of mentions had negative sentiment. 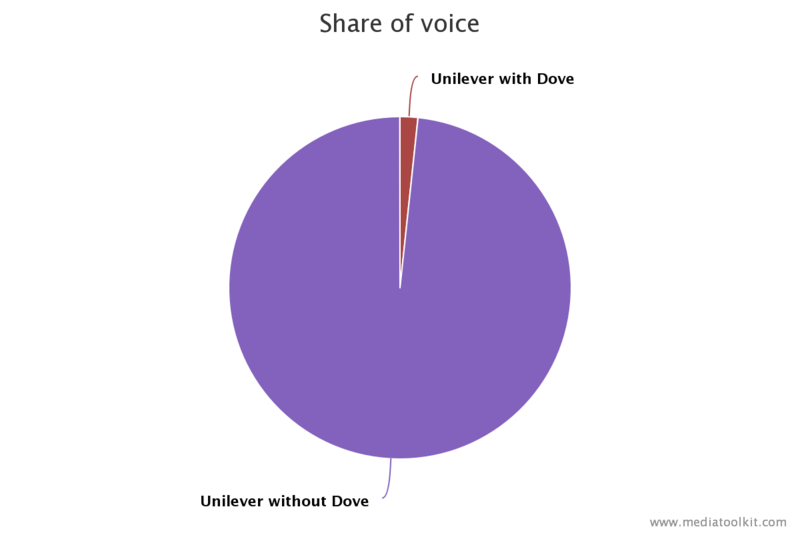 The Unilever brand was mentioned in context with the Dove brand 32% of all of its total mentions in the last week, in comparison with the week before, when the “Dove + Unilever” mentions were a total of just 1.69% of all of Unilever’s mentions. One major point to remember is that a social media crisis rarely happens because ordinary people are trying to raise awareness about an issue. The main drivers of most crises are influencers and the media. This is because 99% of all social media shares die with the next sharing cycle. In translation – even if you share a post, your friends probably won’t. Even when you’re outraged, they probably won’t be. Most people probably didn’t even notice the Dove ad in their feed, because they didn’t pay as much attention. But when an influential person put a spotlight on it, it suddenly became obvious, prompting the users to share the issue. The story proved interesting enough for the journalists to cover. As a result, more users learned about the issue and started sharing it among their peers. As a general rule, if you see users complaining, try to put down an offensive post before someone influential shares. You might prevent a lot of headache down the road. Where was the ad discussed the most? 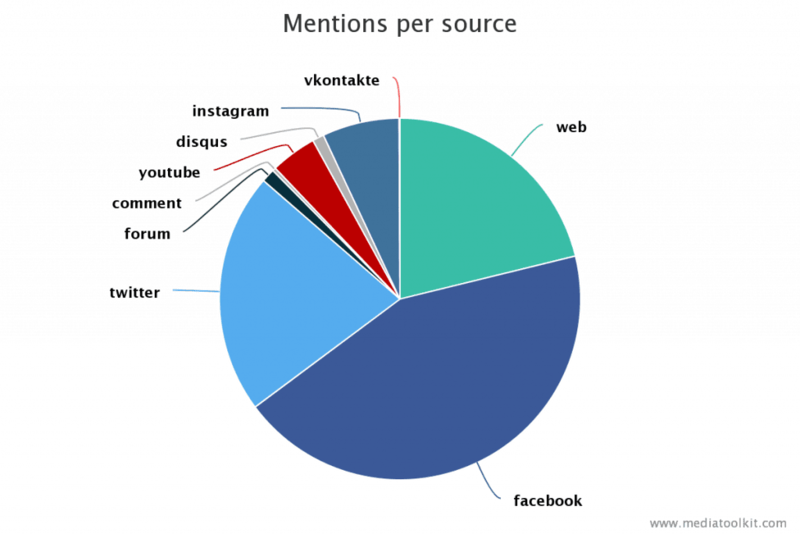 The topic was most frequently discussed on social media, with Facebook and Twitter making up a total of 65.2% of all conversations. This makes sense, since the crisis originated on Facebook. While not a platform that’s typically not associated with discussions of social issues, Instagram users took to posting memes and short videos about the subject, contributing to 6% of total discussions. 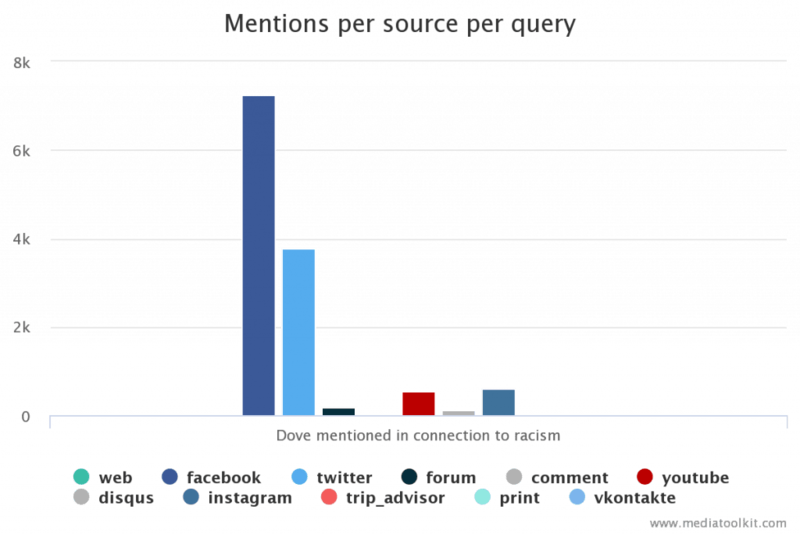 Note: Data shows online discussions, without other sources such as TV and print. What was the general sentiment towards the issue? 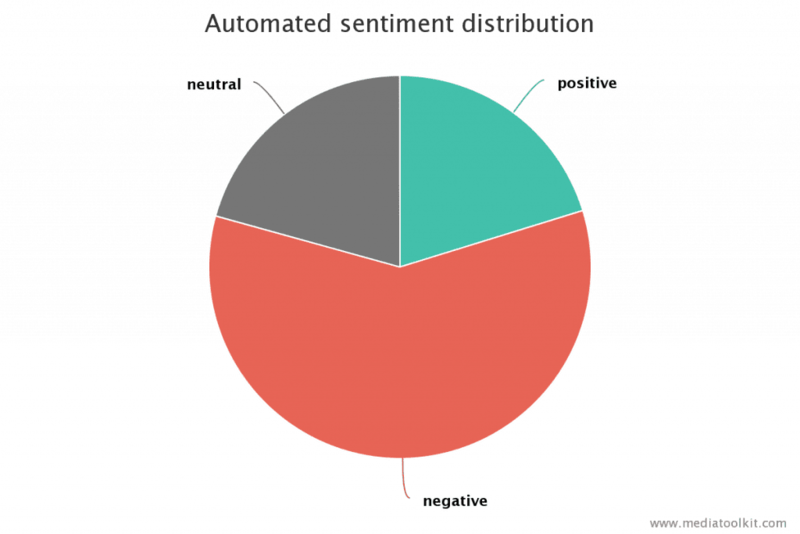 Our automated sentiment system (90% accuracy) calculated a prevailingly negative sentiment towards the advertisment, with more than 6.000 mentions being marked as having negative sentiment. This is not surprising, since the brand itself was mentioned along with the variants of the word “racism” or “racist” more than 12.000 times! How many times was Dove mentioned in connection with “racism” over the last 7 days? There were more than 12.000 users that connected the ad with racism in the observed time. Note: Chart shows only social media channels, without web, forums and blogs. How did the crisis reflect on Unilever? Dove is one of Unilever’s 400 brands, but an interesting thing happened during the crisis. 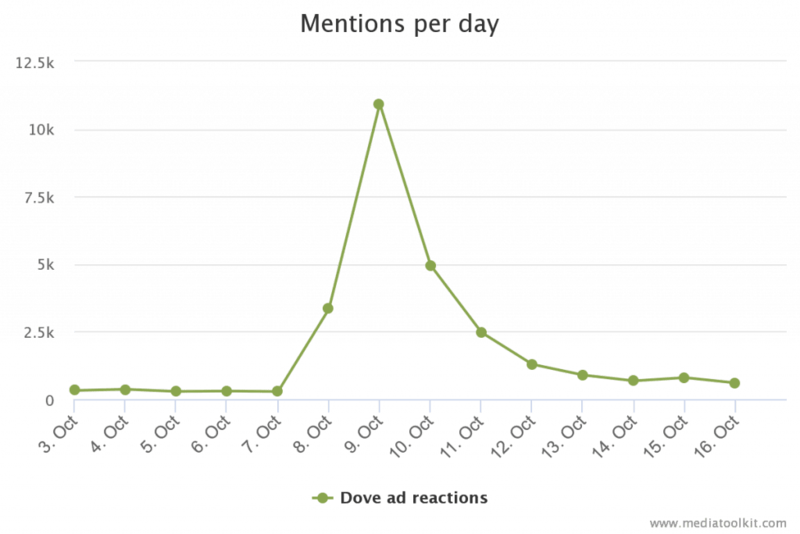 Unilever itself had more than 34.000 mentions in the last week alone. But, despite being just one of 400 brands, of those 34.000, more than 12.000 were in the context of Dove. That means more than 35% of mentions a global corporation with more than 400 brands was due to one brand’s ad. 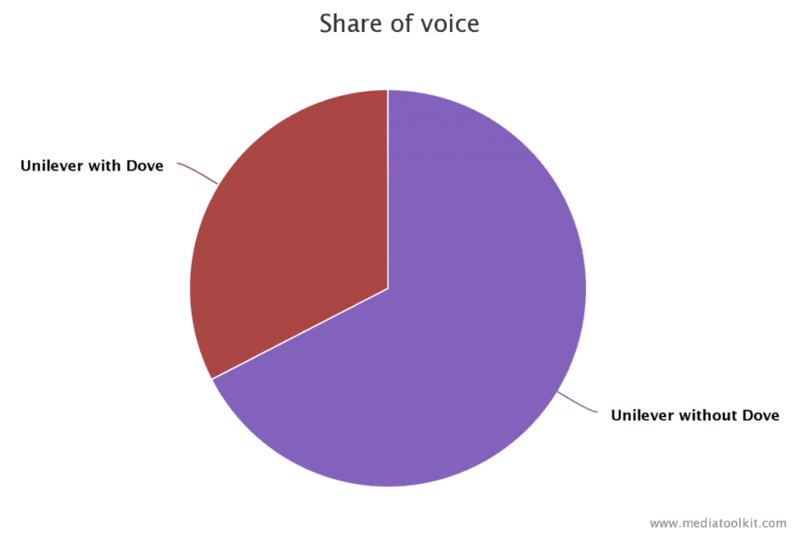 Just compare it to the week before, and you’ll see the usual is less than 1% of all Unilever mentions. That means that despite Dove being just one of Unilevers 400 brands, it greatly influenced whole corporations reputation. How long did the crisis last? Depending on whether you are asking Dove’s PR service or a random observer, the answer can range from “an eternity” to “just a bit”. From October 7 – October 11 the crisis was discussed frequently, but then other things started getting attention. As you can see from the graph, the topic cooled down after a a week. Today almost no one talks about it anymore. The #boycottdove tweets are all but stopped, even though they still occasionally appear here and there. Does this mean that Dove got out unscathed? No, but the damage might be different than you think. While the incident will probably have no influence on Dove’s short-term sales results, the story lasted long enough for a lot of people to get exposed to a negative image of Dove. Reputations are not built overnight, and while they can be temporarily tarnished, in spite of Warren Buffet says, it usually takes more than 5 minutes for a company to go into complete reputation oblivion. But if you chip away at your reputation constantly by doing questionable things, and do not vigilantly monitor and improve your actions, you will lose customers in the long run.